This is an album in the 'Port to Port' series highlighting the port of Belfast with its social and historical idiosyncrasies, its connections with Dublin and its parallels with other ports around the world. This album opens with three songs ‘The Belfast Train’, ‘Waiting Rooms’ and ‘The Second Time Around’ written around the theme of the main Dublin-Belfast railway. The first based on childhood memories of growing up on the West Road in East Wall Dublin opposite the railway embankment, the next song deals with the theme of forever wanting to go ‘somewhere’ and the third with the theme of perhaps wanting to go ‘somewhere else’. This particular railway line provides a wonderful physical and emotional connection between these two divided cities with the viaduct over the river Boyne serving as an iconic link between them. 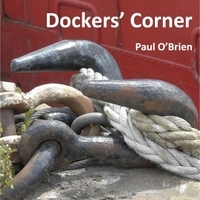 The next three songs are based on real stories from the heart of Belfast’s docklands – Dockers’ Corner in Sailortown, the place where every morning the ‘casual’ labourers were ‘schooled’ or picked by foremen to work. The first song is a personal story, but is also the story of many, many men who worked there. ‘The Result’ is a schooner built in the late 19th century that served as a cargo vessel for different owners over a period of almost 100 years, even during both world wars and has featured in a pirate film starring Errol Flynn (whose father came from Belfast). The ship is now in the possession of the Ulster Folk and Transport Museum. Sadly however it is on dry land and there is currently a group of people campaigning for funding to have it restored to its former glory and to have it relocated close to Sailortown as a floating museum. ‘The American Bar’ is one of the pubs on that corner and is very much as it was in the fifties and sixties when local writer John Campbell wrote his wonderful novel based on his youth and the colourful characters of the area ‘Corner Kingdom’. This song includes many of those characters as well as geographical instructions how to find it and some tips on interior decoration. ‘Evensong’ is based on the very moving description given to us by a Belfast journalist of the scene of the aftermath of the Enniskillen bombing on Remembrance Day 1987. This was to prove to be a turning point in ‘The Troubles’. He told us how he stood there on that evening, in the rain, as the hymns of the evensong service mingled with the noise of the heavy machinery clearing the rubble. Many people have left home under perfectly ordinary circumstances, perhaps even after an argument with their loved ones, never to come home again because of some tragic twist of fate, ‘A Song to Say Goodbye’ is for those they leave behind. ‘The Pay Off at the Silo’ is based on a film that is in the possession of the Belfast Dockers Club of the final day at the last of the grain silos in the harbour when many Dockers were laid off. ‘The Ships that run on Steam an Coal’ is a tribute to the men who loaded the coal onto the great ocean liners in the heyday of steam transport. ‘The Gantries at Our Backs’ is a song bringing us back to the connection between Belfast and Dublin. Over the years many families moved south in search of work, many dream of moving back. The Harland and Wolff gantries, ‘Samson’ and ‘Goliath’ look down on Sailortown from a safe distance. Again, the railway in this song links the two towns together, again the viaduct across the Boyne serves as a landmark.